The three daughters of Ruchie, Shaindy Fink, Leah Freier and Faigy Freier, put the Judicial robe on their mom. Brooklyn, NY - It was a historic moment tonight as Ruchie Freier, a Chasidic female lawyer and the founder of the all female Ezras Nashim volunteer ambulance corps, was inducted as a civil court judge at Brooklyn Borough Hall. As previously reported on VIN News (http://bit.ly/2i7igFV), Freier became the first Chasidic woman ever elected as a New York State Civil Court judge after beating out two other opponents on September 13th, primary day. Freier was introduced by several speakers including Brooklyn’s acting district attorney Eric Gonzalez. 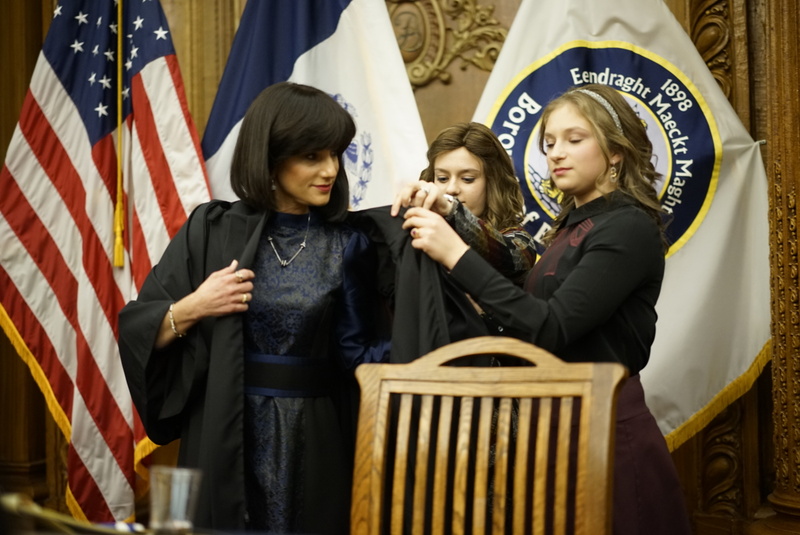 Surrounded by her parents, husband, children and grandchildren in Borough Hall’s ceremonial courtroom, Freier donned her black robe as she was inducted as a judge by her uncle, former Judge David Schmidt, in an evening that included a Yiddish rendition of “G-d Bless America” by singer Lipa Schmeltzer. Freier spoke eloquently for approximately 17 minutes, proudly displaying her Chasidic heritage. She freely mixed Hebrew and Yiddish words and concepts into her speech, translating them into English, simultaneously showing her connection to her roots while demonstrating her commitment to all Brooklyn residents. Freier thanked her many supporters and her family and singled out five young Chasidic boys who prayed for her in the final hour of the election, describing them as members of the Kiddush Hashem Club. Thanking the sitting judges who have already reached out to her, Freier acknowledged she has much to learn from them in her new career but said that she intends to return the favor by doing some teaching of her own. Freier, herself an Ezras Nashim EMT volunteer , expressed her appreciation to her colleagues at the ambulance corps for covering her shifts when necessary and helping her show the world that Chasidic women are capable of remarkable achievement. Noting that her own family members found sanctuary in America after World War II, Freier said that she was raised to be grateful to live in a place where immigrants were welcomed warmly and given the opportunity to succeed without compromising on their religious practices. Why are pictures of women ok here but not in Jewish paper publications ? I must say her eidelkeit from within and out is so visible! I dont know her,a nd may she have all the hatslocho!! She is indeed a special person and her husband a Masmid and Talmid Chacham. May she make a Kiddush Hashem daily; not like some other so-called Orthodox male judges. The return of "Devorah Hashofetes"! Ken yirbu. Now let's see some responsible openness in the Knesset. I'm very proud of this erliche woman's achievement. If she will have a case with a Yid and a goy, is there any possibility whatsoever that the goy will be given a fair trial, which he deserves, or that she will rule in favor of the goy? LOL.